Noted international wine critic, blogger and wine writer Jamie Goode had this to say about the Pearl Morissette Estate Winery Black Ball Riesling 2012. “This is a powerful limey Riesling that’s intense, dry, mineral and citrus. It has lovely structure and weight, and really needs time to grow into itself. 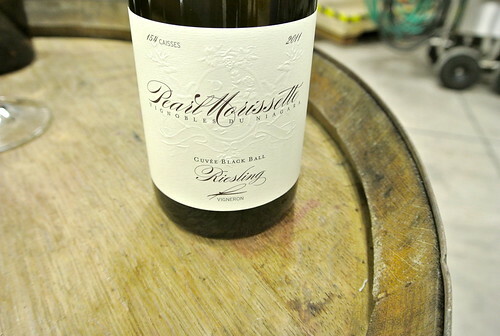 ‘It’s still a baby,’ says (winemaker) François Morissette.” He gave it 93 points out of 100. For François Morissette (above), vigneron and managing partner of Pearl Morissette, “it was a hard thing to get his head around,” explained the winery’s ambassador Svetlana Atcheva during a tasting on Friday at the winery. She said the wine passed all the lab tests, but failed during the tasting portion. It’s not the first time VQA has rejected Morissette’s very different Riesling. The 2010 version was dismissed a whopping four times, costing the winery $250 for the first try and $107 for each rejection after that. The 2011 version wasn’t submitted for VQA approval but the wine acquired a playful new name: Cuvee Black Ball, a not-so-subtle reference to the previous rejections from the VQA panel (note the circular black ball on the back label where the VQA stamp would have gone). It defies logic and really points to a VQA quality assurance system in need of some serious modernization. In pretty simple terms, it should be evaluating to make sure the grapes are 100% grown in Ontario and conduct lab tests for faults. The style of the wine, whether it’s too dry, too leesy, wispy sediment (what?? ), and most importantly “atypical” are descriptors that should be inconsequential to VQA status. Riesling is made in many different styles, as is every other wine produced in Ontario and the world. How is an appassimento (dried grape) style of Riesling not “atypical?” What about barrel aged, barrel fermented Riesling? Is that typical? How do they handle botrytised affected Riesling? Well, I’ve seen all of the above proudly labeled VQA. I’ve seen multi-varietal white blends made with everything under sun crowd LCBO aisles, they never seem to have trouble passing through the VQA panel. Typical? Don’t think so. But I don’t have a problem with that, as I don’t have a problem with Morissette’s wine being approved VQA — in fact, it should be. VQA executive director Laurie Macdonald said she can’t talk about individual results but can offer some general comments. Morissette goes to great lengths to make his wines at the highest echelons of quality using the least amount of intervention. “He is completely committed to making bio-chemically sound wines with no faults,” says Atcheva. The only thing added to the wine is sulfur dioxide at the time of bottling. Atcheva and Morissette believe it’s the dry style of Riesling, completely dry, that has the VQA panel in such a funk over the Cuvee Black Ball, even though Macdonald disagrees with that statement. It could be true, I don’t know the answer, but do know that the panel is human and can make decisions on many different factors. 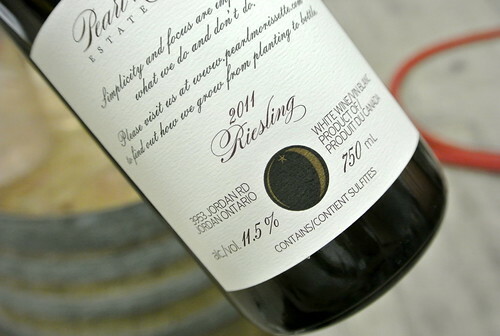 The bulk of Rieslings made in Ontario are built on a foundation of residual sugar (typically from 9-35 grams per litre) to counter the naturally high acidity encountered here and also to appeal to the greatest number of consumers who crave sweetness in their wines, especially Riesling. Dryness can be perceived as “atypical” if the only thing you ever drink is semi-sweet or sweet Riesling. That is not the style Morissette wants to make. The Black Ball Riesling is a fascinating wine whether you like it or not. It is purposely different and extremely well made to exacting standards determined by Morissette. 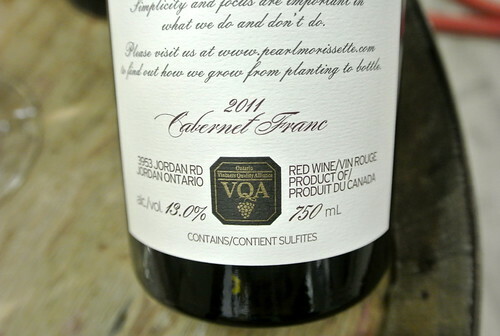 So, how does the VQA quality assurance process work? • Sensory evaluation (or tasting) is a cornerstone of the wine evaluation process that VQA Ontario uses to determine if a wine meets the required standard for appellation status. • Finished wines are also subject to a comprehensive chemical analysis and a review of the wine content and label claims. • Ontario appellation wines offer the consumer a guarantee of origin backed up by a quality assurance program. The purpose of the tasting is to determine if the wine meets criteria established in regulations at the time it is submitted for testing. • The wine is within an acceptable range of varietal character for the stated varieties (where grape varieties are declared on the label). • Comprehensive control measures are taken to ensure the tasting process is objective and fair and that it is carried out in a consistent manner. • All samples are tasted by a trained panel of tasters without being identified. • For VQA Ontario’s purposes, the sensory evaluation is strictly to determine whether the wine meets the standards set out in regulation. • The ultimate purpose of the VQA tasting is to ensure that the wine is likely to fulfil the consumers’ expectation based on what appears on the label. For example an appellation of origin wine from Ontario that declares Riesling on the label should be free of common wine faults and show at least some character associated with the Riesling grape variety. Here we have a panel of LCBO product consultants determining what is fulfilling for consumer’s expectations. Who cares what they think? Go ahead and make great recommendations in LCBO stores for your customers, point consumers in the right direction, etc. 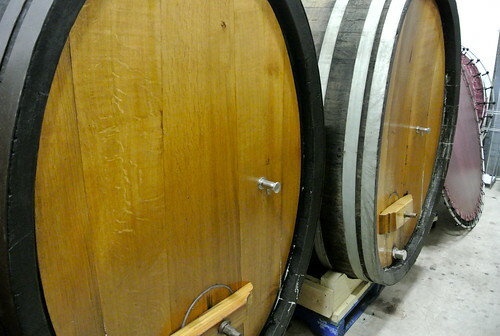 But don’t determine what style of wine should be made at Ontario wineries. That is definitely NOT your job just because you are part of the government monopoly. At the very least, this should be an independent panel based on professional experience. Why the panel is made up exclusively of LCBO product consultants is just plain puzzling … is that a law or something? Most of the wines they pass or fail never make it to LCBO shelves so style should have no bearing on passing or failing. This is a perfect example of why VQA needs to be revamped. Pearl Morissette Black Ball Riesling isn’t the first good wine to be rejected by VQA, not by far (and many wineries have given up trying to submit anything different). The very fact that wineries aren’t submitting wines because they fear rejection based on it being different means it’s time to rethink VQA. It might be time to recharge their batteries and at least discuss what the role of VQA really is. Morissette has touched on a nerve here with his “black-balled” Riesling and now has the attention of sommeliers, wine lovers and international media to at least start a conversation about the perceived unfairness of it. @Wine_Discovery @rickwine @PearlMorissette VQA tasting panel made up of LCBO PC’s is doing unspeakable damage to our Ont wine industry. @rickwine @PearlMorissette Stupid. If no one challenged the status quo there’d be no Tignanello, no Nyetimber, and no vinifera in Ontario. @Wine_Discovery @rickwine @frogspadca @PearlMorissette it’s not their job to determine whether a wine is “good” or if they like it. 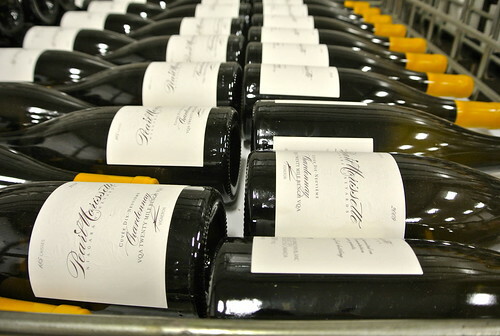 Morissette has built a reputation as a skilled winemaker committed to high standards. 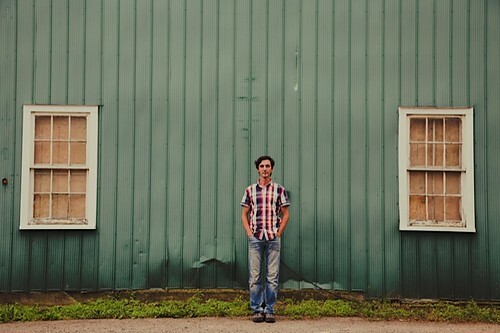 He’s trying new things, breaking down barriers and getting attention far beyond Ontario’s borders. Yet here, where he has chosen to make wine, his biggest obstacle standing in his way is the very organization that is supposed to be setting high standards for wine in Ontario. It is mind boggling. Simply mind boggling. Here’s my review of the Black Ball Riesling 2012 (available mid-fall at the winery and online). 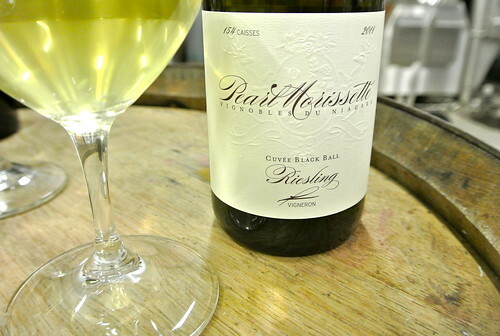 Pearl Morissette Cuvee Black Ball Riesling 2012 ($25, fall release with or without VQA approval, 92 points) — A jarring nose of grapefruit, lime, apple skin and powerful mineral notes prevalent on the 20 Mile Bench (fruit is from the estate’s 19th Street Vineyard). It is bone, bone dry on the palate, with lovely texture and ferocious energy that balances citrus, apple, mineral and acid. There is no mistaking this wine for Riesling, in fact some of the great Rieslings of the world are built this way, but it is stunningly different from the bulk of Niagara wines made in the market place right now. This is built to age, to soften and integrate with time.